Need help with finding Es. I’m in Wisconsin and would love to be able to adopt. Any suggestions? Crabs available may only ve one species, so your crabs colony may already be decided for you! I would just check out the local pet stores in your area when they get new additions in - ask them if they can contact you if they get new shipments in - and hope that some accidently arrive on one of the shipments. I got my E at PetCo. They are few and far between though. Extremely rare occasions will I see an Ecuadorian at my PetCo. I’m resigned to only ever having PP’s. That the only thing my local pet store has had for years. 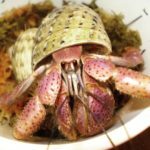 Hermit crabs, created geckos, box turtle and Uromastyx. Whenever I check the tanks at my local pet stores, they're empty or all the crabs are hiding, so I don't understand how other members here seem to be able to identify when a batch of Es arrive. Is it just that they're so much more active? Trust me, if I ask the employees around here about different hermit crab species, they'd stare at me like I was speaking Greek. You just need to ask the employees to look at them. You aren't under any obligation to purchase any. Lorne_Clawstrong wrote: Whenever I check the tanks at my local pet stores, they're empty or all the crabs are hiding, so I don't understand how other members here seem to be able to identify when a batch of Es arrive. Is it just that they're so much more active? Trust me, if I ask the employees around here about different hermit crab species, they'd stare at me like I was speaking Greek. Yes, because the categorize hermit crabs as "fancy" which are painted shells, and "natural" for ones that have shells from the wild. Hermit crabs that are in natural shells are taken right from the beach, and not offered any different shells. The painted ones are taken as well, but with their regular shells cracked open by manufacturers in a warehouse, and tossed in a bucket full of painted ones. It's very heartbreaking, and unavoidable. We really would like to change the ways of stores with crabs, but it's extremely hard to get a strong word out.